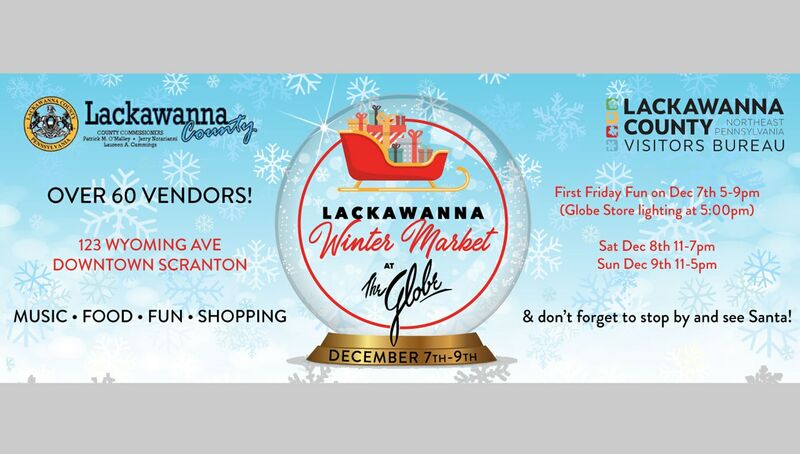 The Lackawanna Winter Market at the Globe is coming! Friday, Dec. 7, the Market will open at 5 p.m. with the lighting of the Globe store. With over 60 vendors to visit, shoppers can treat themselves and each other to all kinds of delicious snacks, find the perfect holiday gifts and enjoy live music under a large, heated tent on Wyoming Avenue. Scheduled to perform are the NEPA Philharmonic Mentoring Program, the Arcadia Chorale, the Nativity Miguel School Choir and many more. The 3-day Market models itself after medieval European winter markets and recalls the charm of days past when Scrantonians shopped at the Globe department store. Shoppers will find everything they need for the holidays and more while supporting local businesses. On Saturday, Dec. 8, the first 1,000 shoppers will receive a free tote bag to contain all their goodies. To find out more and view the participating vendors, as well as the full music schedule, please visit the Lackawanna Winter Market on Facebook.